I switched locations for a bit this long weekend and set off to Dublin. My first thought arriving into the country was “Oh my God, everything’s in English!” and my second thought was realizing I had no idea what the Gaelic language looked like prior to being there. I spent time at Trinity College, exploring Dublin, and taking the train up and down the east coast. Shoutout to Adrienne Bilak, the amazing host and sister of my friend Ivanna that’s with me here in Amsterdam. 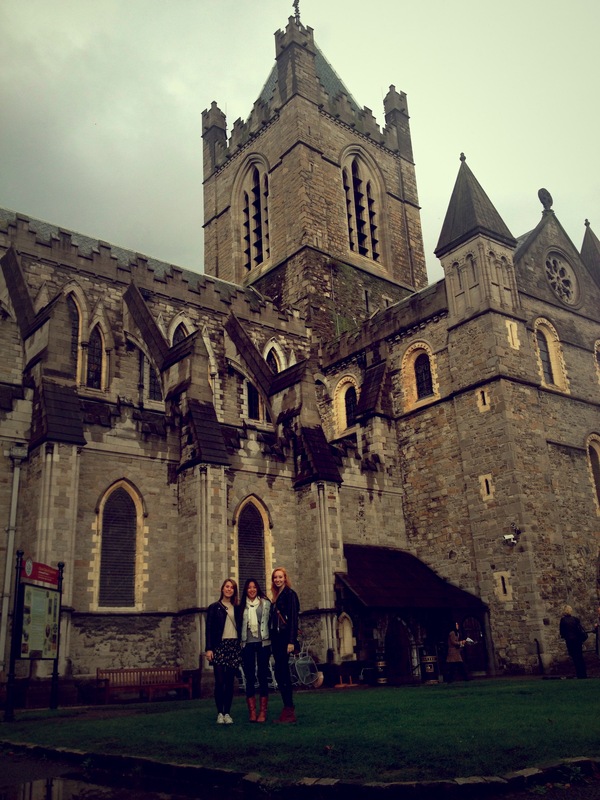 I flew into Ireland alone but met up with Ivanna and Adrienne, then Kaitlyn the next day. The trip was absolutely beautiful, refreshing, and worthwhile. My favorite part was the city itself in the fall, Temple Bar and its music, and of course stopping in the small villages along the water. Can’t forget about the food either! We picked a good weekend for Dublin; it was a bank holiday on Monday, so everyone was out and ready to drink early. Also, Ireland LOVES Halloween, so we saw a lot related to the holiday and the Bram Stoker festival. I think I covered everything and more in this post, but I know my parents will want to read it. At least look at the pictures. Thursday night after my journey to Trinity (see previous post about travel troubles) we immediately ate at O’Neill’s, a famous and multi-story/room bar and restaurant. They had a counter (cafeteria style I guess), where you were equipped (yes– equipped) with not only the main dish you ordered, but a huge amount of baked or roasted vegetables. 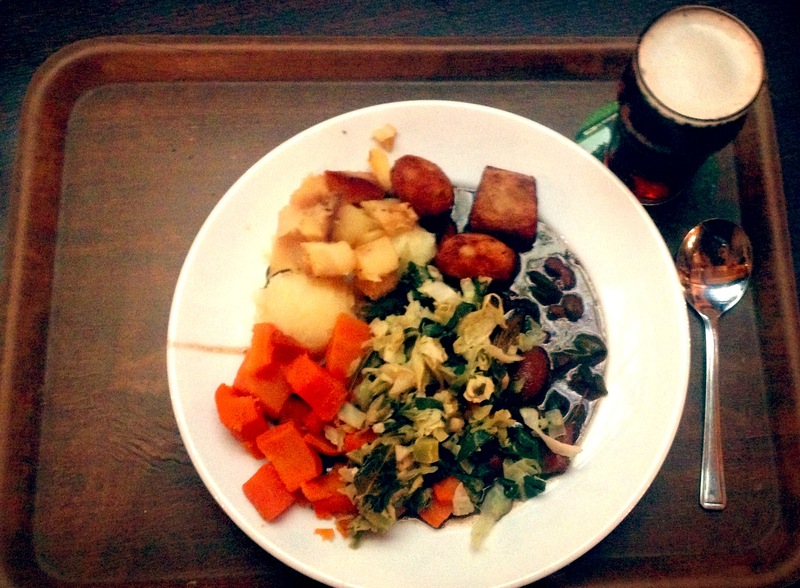 Zack told me I couldn’t leave Ireland without getting a stew, so I went with the Irish Beef and Guinness. Sweet baby jesus it was incredible and I couldn’t come close to finishing it. A half pint of Smithwicks and a full stomach later, we explored the rest of the bar and marveled at the traditional wood and coziness of the pub. Dinner at O’Neill’s, incredible stew! We also went to a Trinity philosophy society debate on the death penalty (they hold semi-weekly debates open to all students), and yes, Texas was mentioned a ton. I just pretended I was Irish, it was easy to do! Afterwards we explored the Temple Bar area and went to a few pubs (The Oliver St. John Gogarty and The Temple Bar) to hear live Irish music and I had my first Guinness in its hometown. The amount that the Irish 1) drink, and 2) love oldies from America is incredible. We sang to “Country Roads,” “Galway Girl,” and “Take it Easy” at least three times. The next morning Ivanna, Adrienne, and I went to the National Museum (museums there are free! What’s that?!) and saw a ton of Celtic gold. While looking at the brooches I learned from Adrienne (the Bilak twin that goes to Trinity) that Joffery from Game of Thrones goes there too! I really wish I would have seen him… I bet people really hate him there. Anyway. Irish history was pretty cool. I especially liked the book that was found in a bog, somehow it was preserved. The tweezers that belonged to the royals were cool too. As my family knows. I’m not that into museums, but I figured this one was important and definitely cost-efficient. 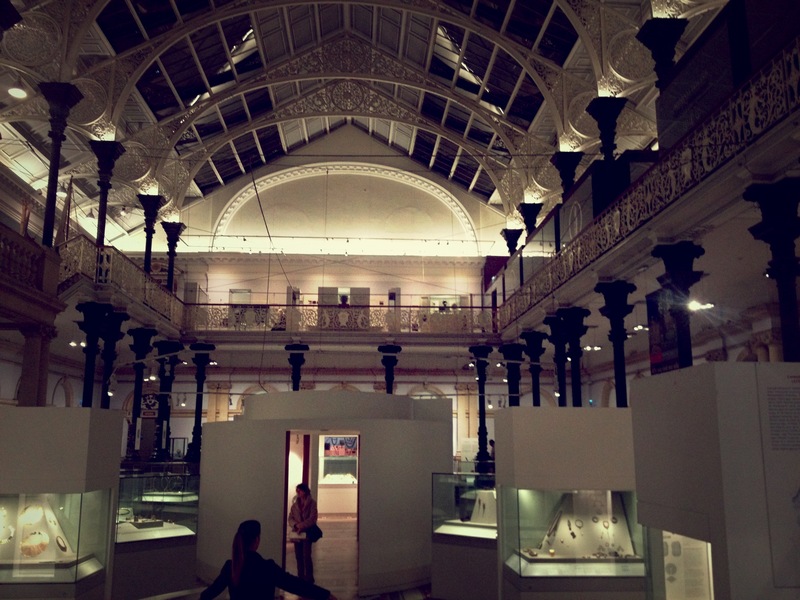 National Museum, can you spot Adrienne? 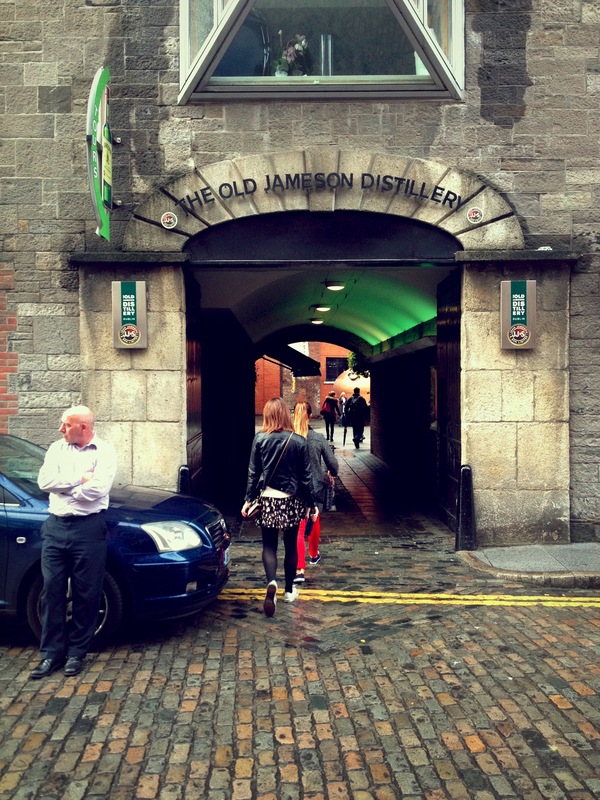 Once Kaitlyn arrived that afternoon, we saw more of Dublin and went to the Jameson Distillery for a tour (and lots of whiskey of course!) where I was a taste tester at the end. 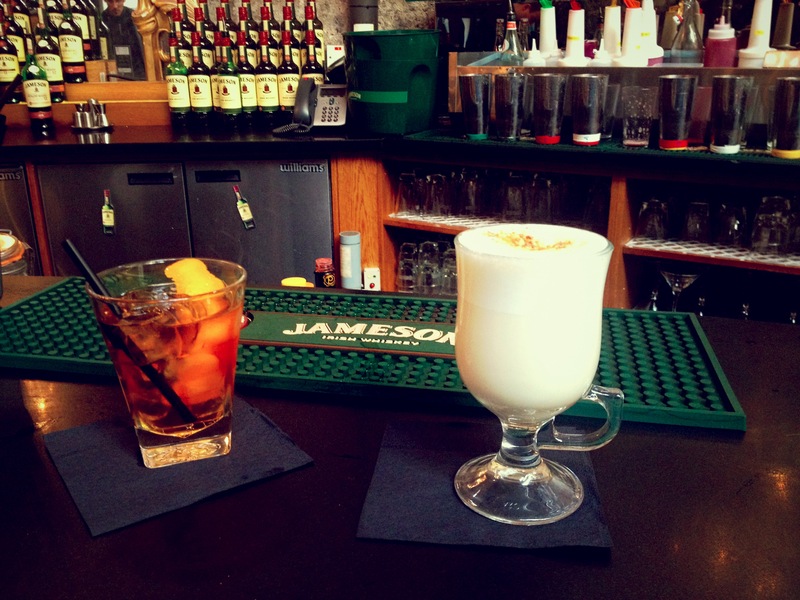 We started the tour with some drinks from the Jameson bar (I had a Jameson Honeycomb, basically warm milk and caramel and whiskey, yum) and ended the tour with a Jameson and ginger, my favorite! Unfortunately I somehow lost my diploma from graduating the Jameson taste test, but it’s the memory that matters. We went to the biggest shopping street in Dublin after, obviously, and then had a quick dinner before resting up for our Friday night out. We explored a few Irish clubs, saw a bunch of really weird but also admirable halloween costumes, and acted like a bunch of college girls. Saturday was rainy, but that was something we grew to respect and ultimately love. The Temple Bar Food Market was being held in town so we went for some breakfast (for the other girls, HUGE scones, for myself, a pork pastry and hot chocolate with Bailey’s cream). Ivanna and I also splurged for some nice olives to snack on later. By this point it was pouring and we decided to head back to Adrienne’s, but then I left to find myself an Irish Aran sweater. SO happy with my purchase (see if you can spot it in my pictures!) 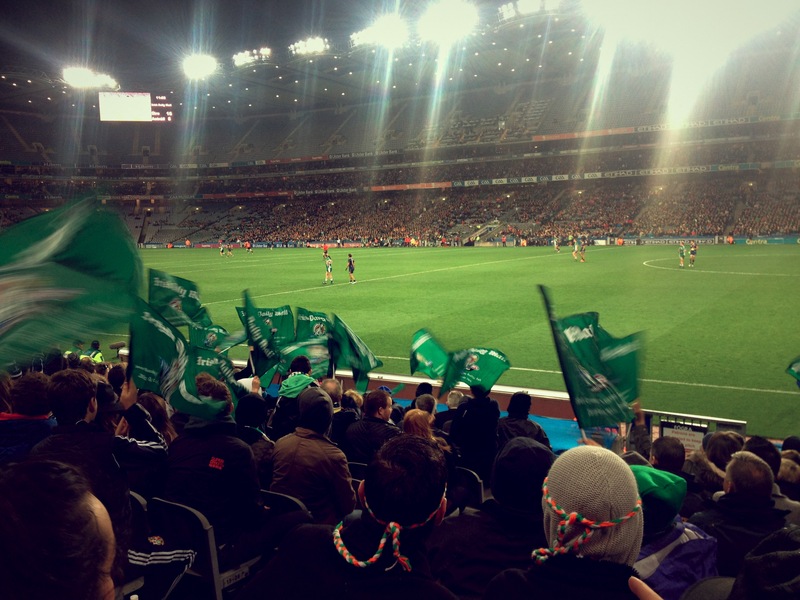 Saturday evening we went to the Aussie rules/Gaelic football Internation Rules soccer game at Croke Park, and we had amazing seats. Internation Rules basically means anything goes (or someone can correct me on this, like I know what I’m talking about when it comes to soccer-like things), so people are running around the field, throwing or kicking the ball, and also hitting each other. Something you have to see once I guess. We–wait for it–went to a pub afterwards to meet up with more of Adrienne’s friends. I met a dental student who was missing a tooth himself (from hurling we assume), an Aussie who was upset about their 100-point loss, and a few other Americans studying in Ireland. All in all, good times. 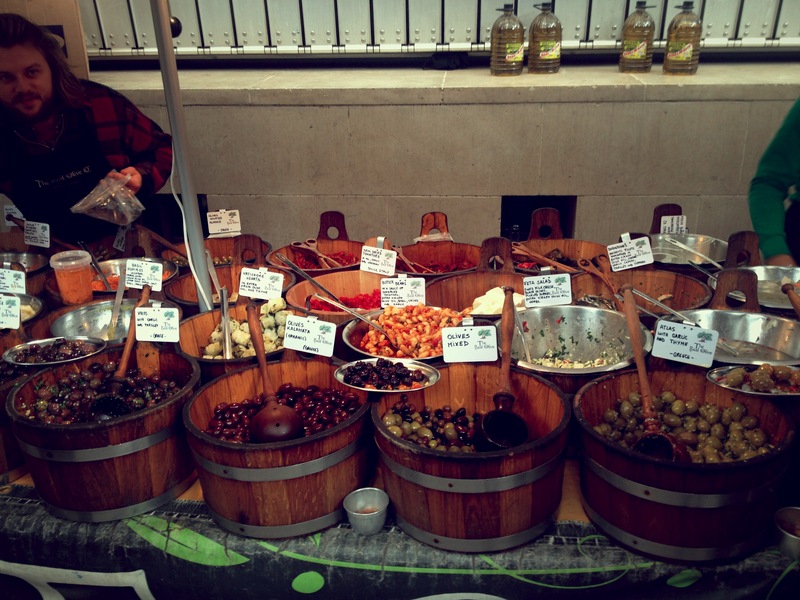 Olives on olives on olives at Temple Bar Food Market, including Ivanna’s olive boy! 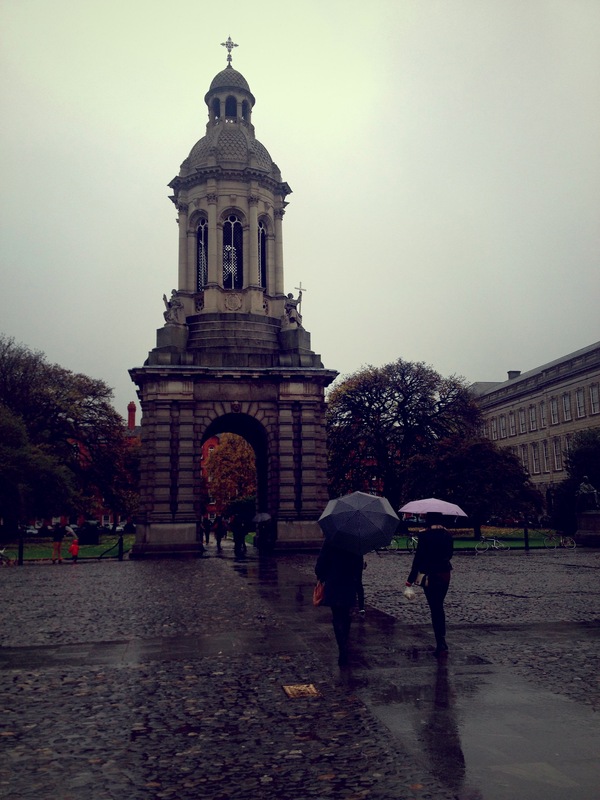 Rainy girls walking through Trinity’s campus, stunning even when wet! International Rules game, violence not visible. 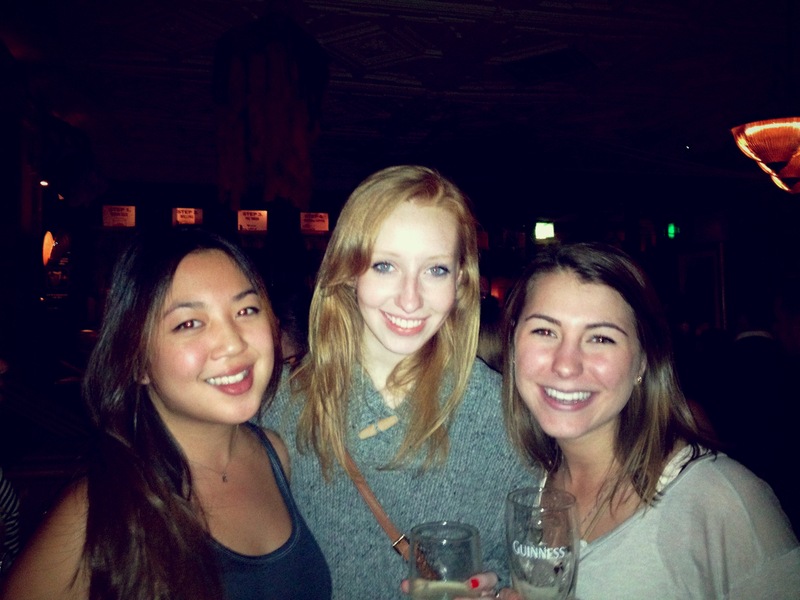 Great girls, great beer, great Aran sweater. 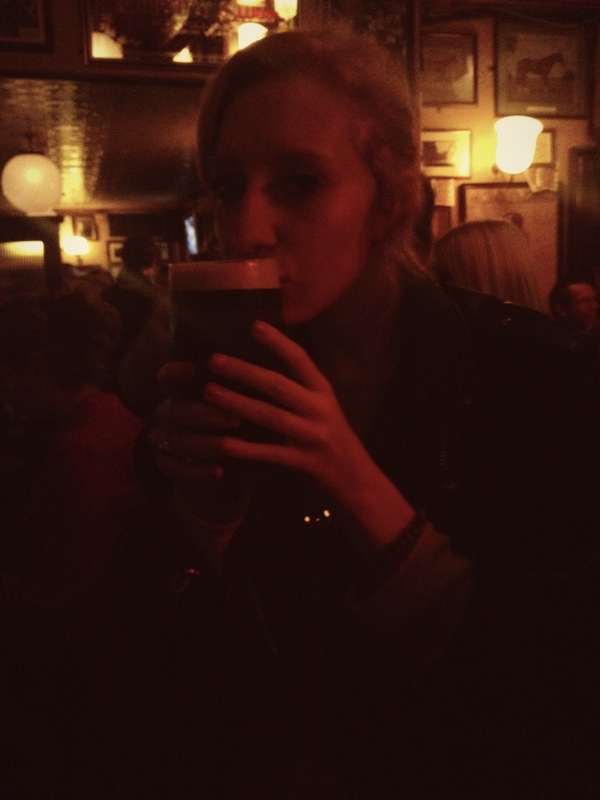 Our final day was spent being as Irish as possible. 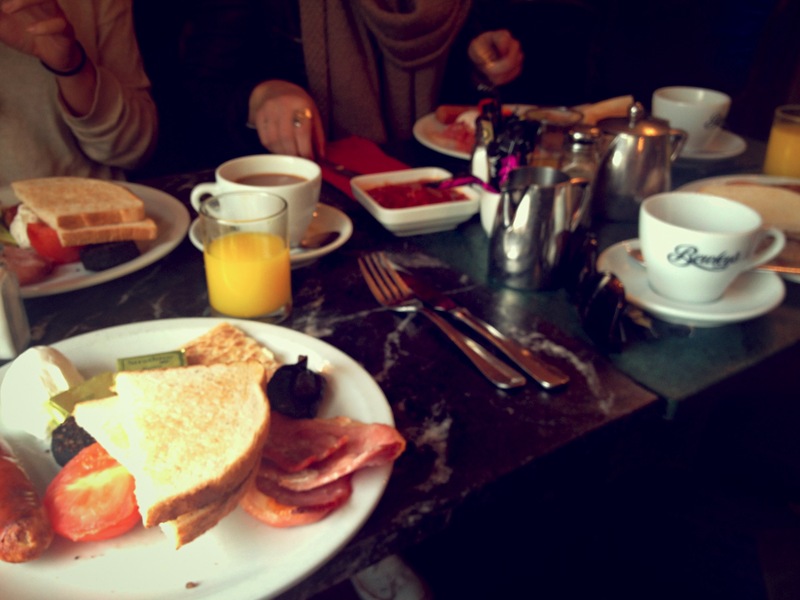 We got up for an Irish breakfast at Bewley’s (poached egg, blood pudding, roasted mushroom and tomato, some type of potato thing, sausage, real bacon) and ate it all in literally ten minutes and ran afterwards as we thought we’d miss our bus to Glendalough. Turns out we did! But as I named my last post, everything happens for a reason. 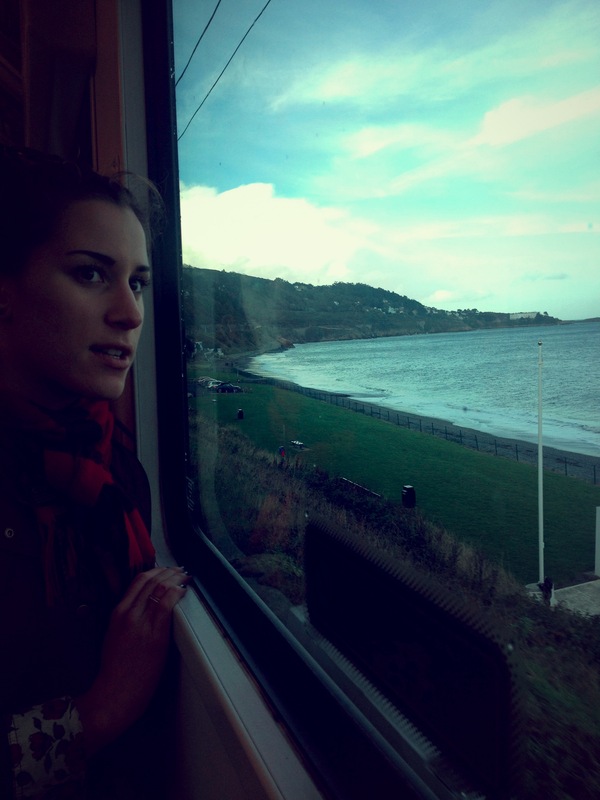 We decided to instead take the DART (shares the name with Dallas) to a few towns along the coast, specifically Dun Laoghaire, Dalkey, and Greystones. 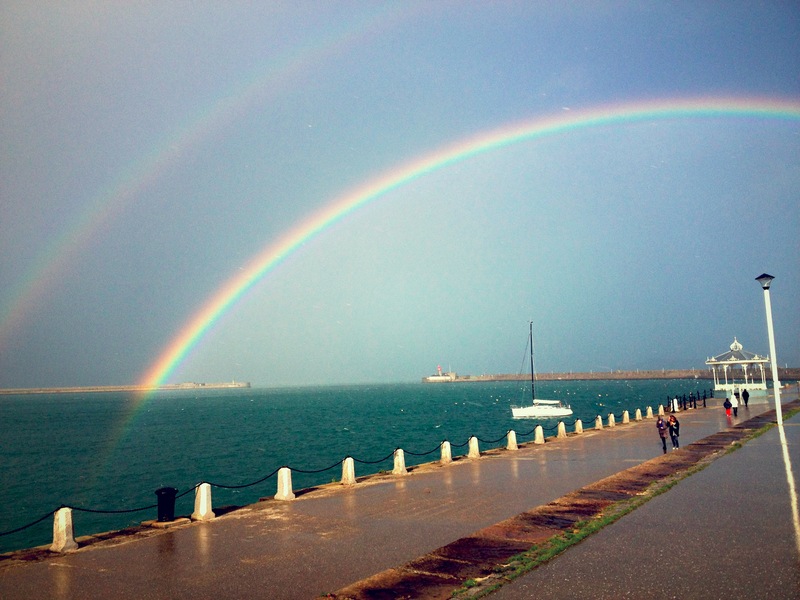 We were greeted in Dun Laoghaire by the most beautiful rainbow I’d ever seen and walked along the docks, basically almost being blown into the water. 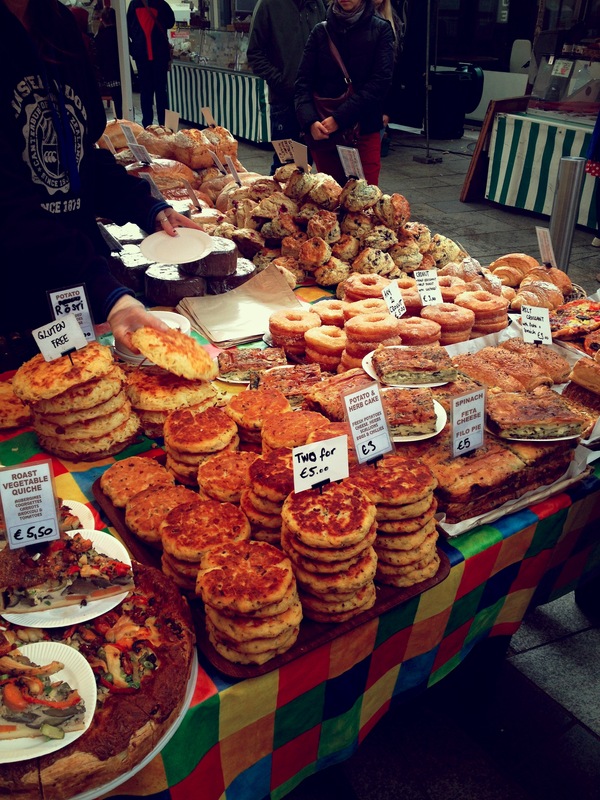 We found a market in the little village (after randomly running into an Amsterdam friend’s older sister who the girls had met the weekend before and had NO idea where she worked) that happened to be the same one that was in Temple Bar a day earlier (scones round two). Dalkey was an adorable city with a little castle in it. We walked all around residential areas (on accident) but ended up seeing some amazing sights, like a school that was in an actual old castle. The ride from Dalkey to Greystones was absolutely incredible. We saw the water and the beach and even some seals, and could look back at the route we’d come from at the Irish cliffs and hills. Stunning. Amsterdam still wins, but Ireland is beautiful in its own way. After a scallop and Sunday roast dinner in Greystones we travelled back to Trinity. That night our same Amsterdam friend’s cousin (so therefore also the cousin of the random sister we ran into) was playing with his band in a very hip Irish bar/club called Workmens. This place reminded me a lot of Amsterdam but with a younger crowd. It was a great way to finish off the trip with my girls. A traditional Irish breakfast, can I get one in America? I’m ready to stay in Amsterdam for a while and am lucky to enjoy the beauty of my city this weekend with Margaret. Despite the intense storms and already feeling a little behind in my classes after missing them from train troubles, I feel so at home and relaxed again. Until next time, when hopefully I’ll have another grand adventure to share!